Those of you who are up on your Agatha Christie lore will know that she wrote six books under the assumed name of Mary Westmacott. This was her way of writing something outside her regular genre of detective / mystery without feeling the pressure from the general public. She got away with it for 15 years apparently before it was revealed that Mary Westmacott was Agatha Christie. Since I've nearly finished the complete canon of the Queen of Crime, just for completeness' sake, I decided to have a crack at the Westmacott novels. I wasn't sure what to expect, to be honest. One of the problems I struggle with the most with Christie is that while her plots are diabolically clever, with red herrings galore and zillions of plot twists, I always find her upper-crust toffee-nosed Englishfolk far too two-dimensional for my liking. But I will confess, this story sucked me in, perhaps because of its connection with music. It begins with a concert in London for a new avant-garde composer which reminded me a little bit of Stravinsky's famous Rite of Spring premiere. There is no riot from the crowd, but the piece is thoroughly modern, incomprehensible and is saying something about the human condition that no one understands. The rest of the story is then a huge flash back following the life of Vernon Deyre, the composer, his childhood friends and what becomes of them. It's all very melodramatic (and somewhat racier than I would have expected from Christie) with love triangles, marriages for money, a reported World War I death and the pursuit of new sound worlds in music. It was written in 1930, and some of the themes (particularly the WWI setting and the rampant anti-Semitism of the times) have probably taken on more significance since the story was written. I'm not saying it's a masterpiece (it's not really) and I'm not even able to get an objective bearing to say whether any non-Christie fans would enjoy this (probably not, and probably not even Christie fans). But I enjoyed it, and it kept me reading and I'll be curious to read the other Westmacott novels. 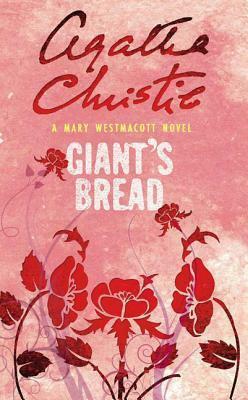 Sign into Goodreads to see if any of your friends have read Giant's Bread.